Tender chicken breasts cooked in minutes in your pressure cooker and then mixed with cream cheese and BBQ sauce. This 3 ingredient chicken is addictive! Perfect to serve on sandwiches, rolled up in tortillas or on pizza. For the Instant Pot: Add water and chicken to the pot. Cover and set valve to “sealing.” Press manual and set the timer to 12 minutes. When the pressure cooker beeps you can do a quick release by pressing the valve to “venting.” Remove the chicken and place on a cutting board. Shred the chicken. Drain all the water out of the pot. Add shredded chicken back into pot. Add in cream cheese and BBQ sauce. Stir and let the cream cheese melt and coat the chicken. Serve chicken on sandwiches, rolled up in tortillas, on pizza, or on salad greens. For the Slow Cooker: Add water and chicken to the slow cooker. Cover cook on low for 4 hours. Remove the chicken and place on a cutting board. Shred the chicken. Drain all the water out of the crockpot. 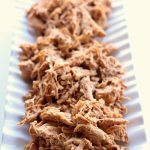 Add shredded chicken back into crockpot. Add in cream cheese and BBQ sauce. Stir and let the cream cheese melt and coat the chicken. Serve chicken on sandwiches, rolled up in tortillas, on pizza, or on salad greens.